We now turn our attention to automobiles. But before doing so, here’s a frame from the eBird occurrence map for the Lazuli Bunting. You’ll see what this has to do with cars in just a minute, if you hang in there with me. 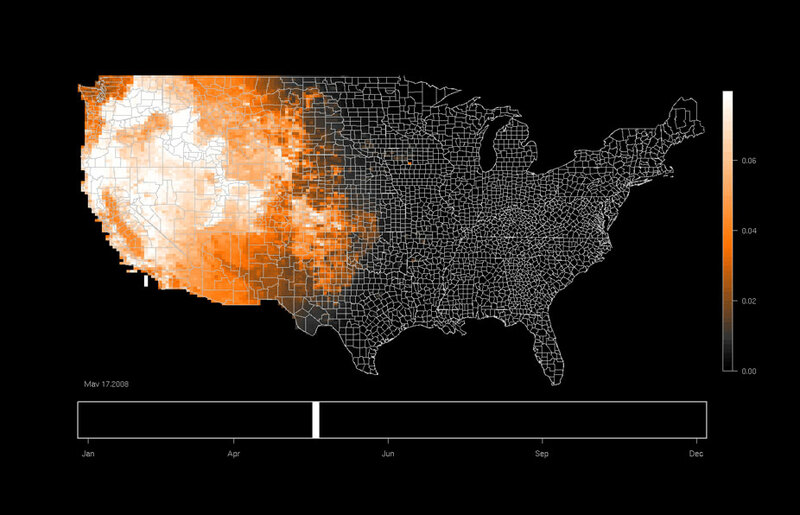 You can view the animated version of this and many other maps over on eBird. Now, back to the automobile. The new cars are presaging the future driverless car by including all manner of techno-gadgets. Can’t see out the back window? We’ve got video for you right here. Somebody in the blind spot? No problem, a detection monitor is all over that. About to run into something? You’ll need to be quick to hit the brakes before your car does that for you. I’m just slightly concerned that we might be overdoing it with the automated sensors. We’ll all be driving around with a mildly annoying robot backseat driver. Where does it stop? Will the car be outfitted with facial recognition software, and automatically slow down when it sees my neighbor, so I can wave and say hello? And parallel parking: I see this as a valued, but threatened remnant of a once great automotive culture. If we let the cars take over, yet another hard-won achievement of humankind will fall. I’m not quite ready to surrender my spacial contextual awareness and motor skills to a bristling array of digital sensors. When the full-on driverless car comes by, I’ll be fine with handing over the keys, but for now I’d like to use my own senses and cognitive skills while they are still operational. It’s now one of the world’s largest collections of ecological data – meaning bird watchers are among the most sophisticated sensors of planetary health that the world has ever produced. We are all sensors now. And some of us can still parallel park.